Imperial College Optical Society (OSA/SPIE student chapter) and the Department of Physics at Imperial College London are pleased to invite you to a Departmental Colloquium on metamaterials, which will feature an invited talk by Prof. Andrea Alù from University of Texas at Austin. 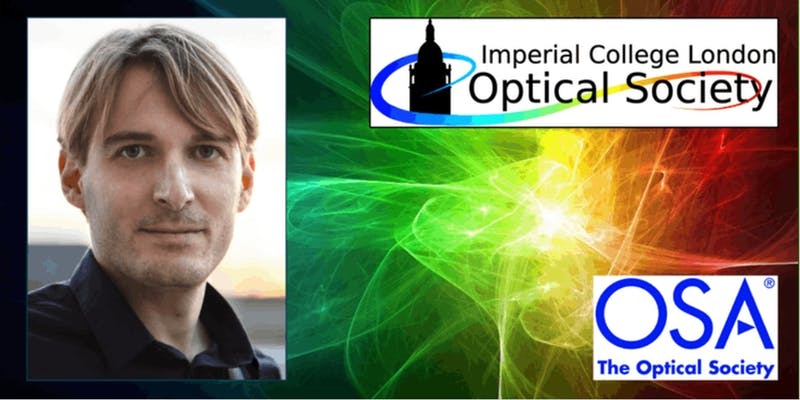 Prof. Alù has, over the last decade, established himself as a world leader in Photonics, Acoustics and Metamaterials, and it is a great priviledge to host him as one of our 2018 invited speaker, thanks to the support of OSA to its student chapter at Imperial via the Travelling Lecturer Programme. Metamaterials are artificial materials with properties well beyond what offered by nature, providing unprecedented opportunities to tailor and enhance the control of waves. In this talk, I discuss our recent activity in electromagnetics and acoustics, showing how suitably tailored meta-atoms and their arrangements open exciting venues for cloaking and scattering suppression, nonreciprocity and topological phenomena without magnetic bias, and giant nonlinear effects at subwavelength scales. Physical insights into the underlying physics and new devices based on these concepts will be presented. Andrea Alù is a Senior Research Scientist and Adjunct Professor at the Department of Electrical and Computer Engineering at The University of Texas at Austin in Austin, TX, USA. He is affiliated with the Wireless Networking and Communications Group,an interdisciplinary center for research and education based in UT Austin with an emphasis on industrial relevance,and with the Applied Research Laboratories at UT Austin. His research interests span over a broad range of technical areas, including applied electromagnetics, nano-optics and nanophotonics, microwave, THz, infrared, optical and acoustic metamaterials and metasurfaces, plasmonics, nonlinearities and nonreciprocity, cloaking and scattering, acoustics, optical nanocircuits and nanoantennas. 85 St. Nicholas Terrace, New York, NY 10031, U.S.A.
His talk, which will take place at 16:00 in lecture theatre 3 of the Blackett building on South Kensington Campus, will be followed by refreshments thanks to support from the Department of Physics, where all attendees will have an opportunity to chat to the speaker and to each other.